Matthew and I had a great day scavenging for plates in Texas. Yes, plates. 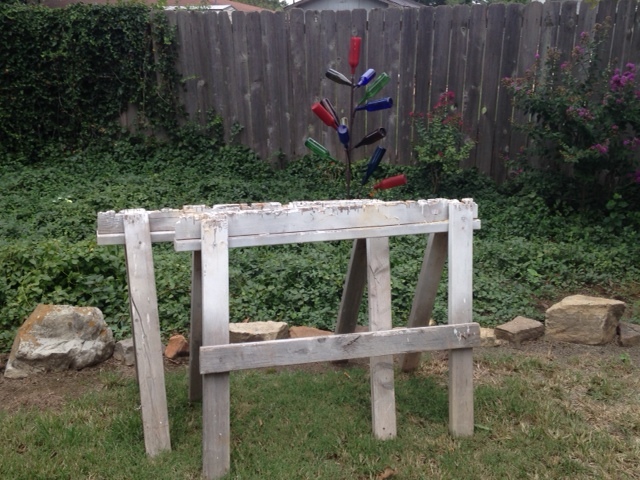 I have an old wooden table that has been outside holding lots of plants for quite some time. I gave it a coat of paint…love this color name, garden soil brown…and will soon sport a mosaic top. The collection of plates sitting on top of the table right now will soon be broken into pieces and glued to the top and made, hopefully, into a beautiful mosaic. I have researched, need to find a few more plates and get started. But that isn’t the reason for this post. I got sidetracked…. People. I read a post this morning by someone who said emphatically, I hate people. WoW. We met the nicest man in a little shop in Wimberly on Thursday on our quest. He and his wife are musicians; he plays guitar and she bass. They spent 25 years traveling and playing as backup musicians at festivals and such, but gave it up six years ago to stay close to home and open their shop. Once he found out Matthew is a trombonist, he was ready to talk. He was so interesting and so nice and just a delight. There are so many very cool people, you just have to get out there and meet them! I leave you this beautiful day with one of Matthew’s cats, Ogopogo, learning to ride the bike…peace! 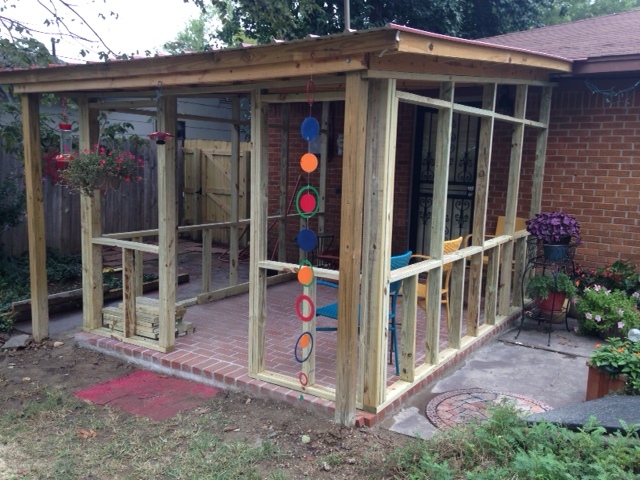 Clay was here yesterday; working on my screened in back porch! 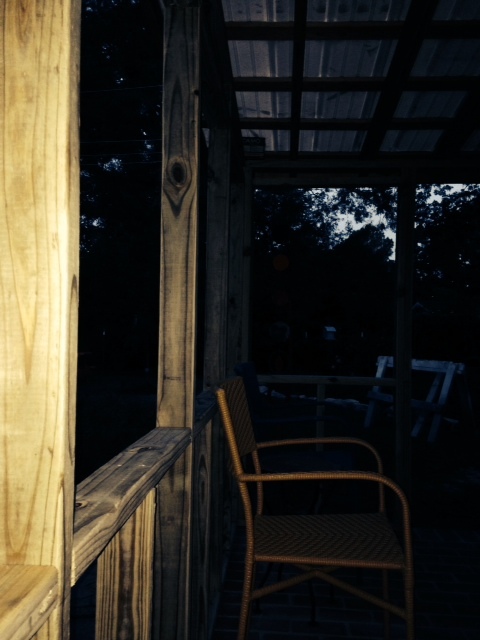 We’ve lived in our house for 30 years and for 29.3 years, I have wanted this porch. Badly. But things happen. You keep thinking next year, and before you know it, you’ve waited so long you think, nah, I don’t have to have it. But I do! I need a quiet, peaceful place; a mosquito free zone, to watch the birds, butterflies and squirrels that I’ve spent all these years attracting to my back yard. I love tinkering around in my flower beds and watching the birds bathing and the hummers zipping by and, well, I just need it. I think Jillie and the Strawbridge Cats will enjoy as much as I will. What’s happened so far…. 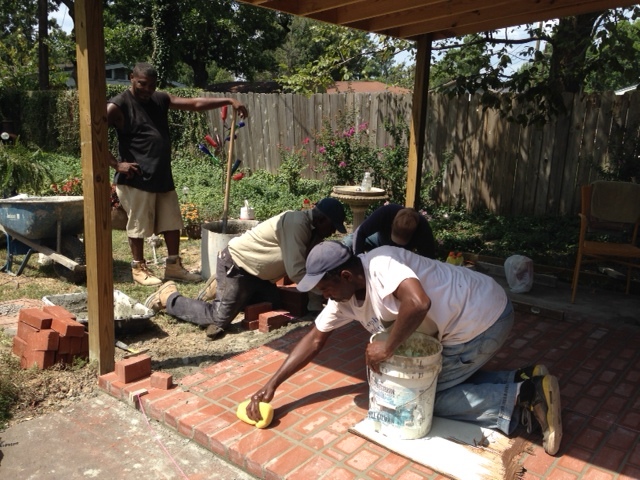 I can’t find the picture I took of the porch right after Clay put the tin roof on; so here are the lovely men who came from Memphis to put down the pavers for the floor. They did such a wonderful job. You know the carpenter is getting serious when the saw horses come out. We have the frame! The screens will be custom made so that, instead of being stapled with trim, they will attach with screws…just in case a family dog or cat or person tears a screen. They will be easily removed separately, screen replaced and put back up. I have plans for a potted flower bed on the right next Spring…maybe use some of the seeds I got from Monticello this Summer! Jillie and I went out early this morning to see what was happening in our new little retreat, but the mosquitos weren’t fooled by the framework. They knew they could still get to us; so we made a hasty retreat back into the house.